Sofía Mulánovich Aljovín (born June 24, 1983 in Punta Hermosa, Lima, Peru) is a Peruvian surfer of Croatian descent. 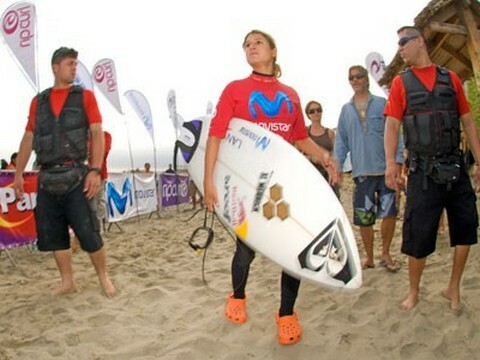 She is the first Peruvian surfer ever to win an Association of Surfing Professionals World Championship Tour event. She is the first South American to ever win the World Title. In 2004, she won three out of the six World Championship Tour events and finished the season as World Champion. She is sponsored by Roxy. 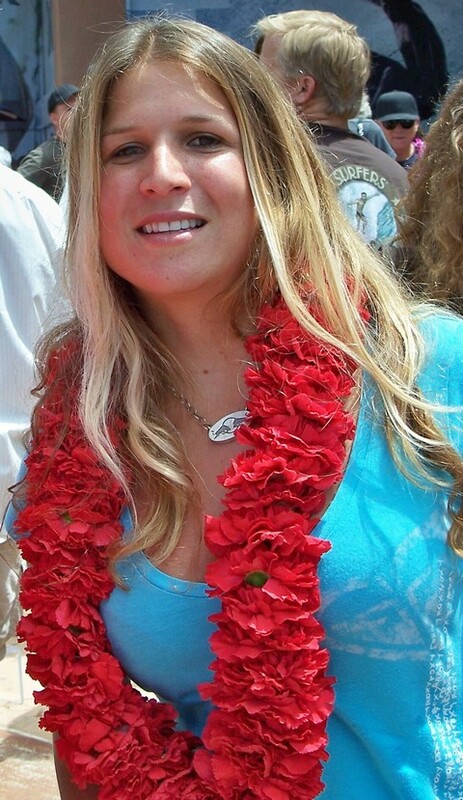 On July 27th, 2007, Sofia Mulanovich was inducted into the Surfers Hall of Fame during its 10th Anniversary celebrations. She is the first South American to have this honor, having had a major impact on the sport. World champion accompanied with security staff. SofiaSurfing is not an Olympic sport, but the Olympic Museum in Laussane, Switzerland, has included Sofia Mulanovich, a former world surfing champion and a superstar in her homeland of Peru, in its "Heroes" exhibition, which opened today and will run through the summer. The exhibit recognizes athletes from different eras, and Mulanovich earned a spot alongside such luminaries as Roger Federer, Tony Hawk, Michael Jordan, Duke Kahanamoku, Carl Lewis, Diego Maradona, Michael Phelps, Shaun White and Tiger Woods. Mulanovich is the only contemporary surfer in the exhibit. "Even though surfing isn’t in the Olympics yet, it is a true global sport and connects people worldwide," says Mulanovich, 25, who's in Australia awaiting the start of the Rip Curl Women's Pro, an ASP Women's World Tour contest. "It is a huge, but humbling honor to represent surfing on this global stage alongside the best athletes of all time." Among the items being shown for Sofia are a customized Channel Islands surfboard, designed by a young fan in Peru during Red Bull's "Pimp My Board with Sofia" design competition. Also on display is an award-winning documentary titled "Sofia," profiling the surfer and her influence on surfing in Latin America. Outposts would like to congratulate all athletes on the "Heroes" list. Surfersvillage Global Surf News, (Huntington Beach, CA) July 14, 2005 --- Roxy, a division of Quiksilver and the leader in women's surfing and boardriding lifestyle, congratulates ASP World Championship Tour (WCT) World Champion and Roxy teamrider Sofia Mulanovich for winning the 2005 ESPY Award for Best Female Action Sports Athlete. Mulanovich, 21, of Peru, was awarded the prize last night at the 2005 ESPY Awards, which were hosted by Matthew Perry at the Kodak Theatre in Los Angeles. "Sofia continues to amaze everyone in the women's surfing community, and Roxy is extremely proud of her," said Randy Hild, Senior Vice President, Roxy Global Marketing. "She has worked so hard to make herself a champion, and she truly deserves all the honors she's receiving. We know that Sofia will continue to be a major force on the women's professional circuit for many years to come." "I'm very happy to win the ESPY Award, and I want to congratulate all the other women who were nominated," Sofia Mulanovich said. "I give a lot of credit to my friends and family who have supported me and, of course, everyone at Roxy. It's been a really amazing year, and the most important thing for me is to keep working hard and try to defend my title." Mulanovich's phenomenal 2004 season included a first place finish at the ISA World Championship Title competition in Salinas, Ecuador; first at the Roxy Pro WCT in Tavarua, Fiji; first at the WCT competition in Teahupoo, Tahiti; first at the Roxy Pro WCT in Anglet, France; and second at the Honda US Open of Surfing in Huntington Beach, California. She placed second at the Roxy Pro Hawaii, where she was named ASP (Association of Surfing Professionals) World Champion. Among her other honors, Mulanovich has also received the Laurel's Sport Award bestowed upon her by Peruvian President Toledo, and a monument with her name has been placed outside of Peru's National Stadium in Lima. Mulanovich's 2004 world championship title is the latest in a long string of accomplishments she has garnered during her career. She was voted "ASP Rookie of the Year" on the World Championship Tour in 2003, was voted as 2003's Number 5 "Favorite Female Surfer" in the Surfer Magazine Poll Awards, won Surfer Magazine Video Awards' "Best Wipeout" category the same year, and was the Peruvian National Champion four years in a row. Fans can view Mulanovich on the tour, where she currently sits at the top of the 2005 WCT rankings, as well as in a new documentary chronicling her life that will be released in January, 2006. All the photos on this page are from www.sofiamulanovich.com . Sofia Mulanovic, the 24 year old surf champion form Peru, is a legend. Sofia owns every title there is to be won, including a women's Dream Tour title from 2006. Another day another Croatian billionaire. Dietrich Mateschitz (born May 20, 1944 in Sankt Marein im Mürztal, Styria) is an Austrian businessman and billionaire. He is of Croatian heritage. Lives in Salzburg, but also owns Laucala Island, off Fiji. Brilliant in marketing and business, he holds 49 percent of shares in the energy drink producer Red Bull, which is sponsoring Sofia Mulanovich.